On the afternoon of October 18th 1968, in Mexico City our world was about to witness the “historic moment” of sports history. The world was bubbling and very revolutionary then. It was the late 60’s and Vietnam, Paris and Prague had all brought people on the streets. Flower power was asserting itself and rebels (with causes) were standing for their rights. Muhammad Ali and Bob Dylan were each leading their own revolutionary battles. Martin Luther King and Bobby Kennedy had been assassinated for their respective causes. Then there was the black power movement and only one day before, two black American athletes had been thrown out of the Mexico Olympics for demonstrating the Black Power salute on the medal stand. On this afternoon Bob Beamon was about to participate in the Long Jump Final. The world record had moved 22 cms in 33 years, since the record jump of Jesse Owens. Beamon was lucky to get through, as he had two foul jumps in the semis and just scraped through on the third. No one, literally no one in the world, could predict what was about to go down. On the first jump, Beamon took a deep breath and tore down the track, hit the board perfectly and soared into the air, landing deep and for a split second his bottom grounded, cutting inches out of his jump. Nevertheless, despite this reverse, the jump clearly was long. It was so long that the automatic tape measure was unable to authenticate this number. So a manual measure was done, which took some 20 minutes of confirmation. When the result was flashed on the board and across the world, it beggared belief. Beamon had broken the record and his own best by 55 cms. When the result came, Beamon himself collapsed on the track in some sort of seizure. Beamon’s jump knocked out long jump as a competitive event, for decades. It is almost 50 years to that event and only Mike Powell has once out-jumped this number. 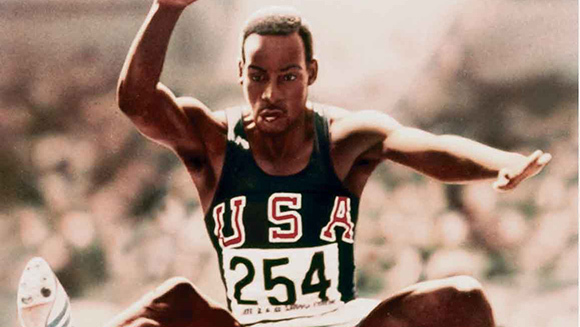 The Bob Beamon Moment is the single biggest sporting surprise in history. Cut to today and the Rio Olympics 2016. Wayde van Niekerk came to Rio as a good 400 metre runner. Niekerk had won the World Championship last year, but Kirani James and Merritt, previous Olympic champions were considered still better runners. Niekerk would expect to be on the medals stand, though he had a mediocre qualifying round. When the lot was drawn, it put him in lane 8 ahead of everyone, and so his goose was cooked. It meant he would have to run the race blind, ahead of everyone else. The best Olympic time running from lane 8 ever recorded was 44.66 seconds. Michael Johnson world record stood at 43.18, recorded in 1999. James and Merritt felt confident that running from mid lanes, the real battle was between them now. Niekerk had no option but to go full blast from the start. But 400 while being a sprint, does exhaust one and one generally ends the race in such a situation as a walking dead. So in the face of this full blast, at 200 metres, James and Merritt (both running fast times also) would fully expect to haul Niekerk in. Infact, if you run the video on the net, it is amazing that Niekerk is so far ahead, that the video actually does not capture him for a bit. Around 350 you can see Niekerk slowing and then most extraordinarily, he kicks on, building a new lead and to the finish. When the result came out, it was 43.03 some 0.15 below the WR, but remember the best lane 8 time. That is what makes this extraordinary. Niekerk ran the second 200 metres faster than the first 200. The best way to gauge this performance, is to look at Usain Bolts reaction when the time is announced. Bolt was waiting for his 100 metres final, where subsequently he also created history. Bolt also left his pre-run interview and went to hug and congratulate van Niekerk. All these videos are on the internet for one to see. So now is this another great, shocking moment in sports history? It is shocking enough for journalists, around the world, to question it in the press conference. It is shocking enough to make ones spine tingle and I just hope it goes down in history as one of those Bob Beamon Moments. A dark empty road lit by yellow lamps, which cast a halo around themselves. Creepy shadows make the road look sinister, the cracked pavements adding to a touch of the surreal. The dullness affects the colours, which fade into neutrality, in the gloom. You cannot tell which is what. Quietness and such stillness, yet constantly with the backdrop of a distant traffic sound, from some neighboring highway. The buzz forever indicates a world where constant action is brewing. Lonely lives lived in isolated houses, each a world in itself. There are those who live inside these castles, who have not touched their surroundings. They go about their business in the morning. The neighbors see them reverse their cars out and drive off to don’t-know-where. They work with their heads down all day and at the end return exhausted to their abode. Quietly in the shadow of the dark they creep into the house, parking their cars in designated areas, making sure there isn’t much noise. They look around apologetically when the garage door makes its squeaking sounds; almost as if the surrounding should not know that they are back from the living world. Sometimes nosy neighbors wait for them to come in. But mostly there is indifference. Who really cares when and what their neighbour is about. They want them to be away from their own lives, so that no connections are formed. That is vitally important, as connections mean emotions and that leads to obligations. He does not really want an obligation. There are too many already. Does he not have to finish his presentation for his boss to review and then there is the steering committee to report to, on the progress of the project. What about the taxes. Forever forking out local taxes, sales taxes and federal taxes, it is the outside of enough. The wife has to worry about the boy. They are social misfits nowadays. Have you not seen how he avoids eating at the dinner table, but instead takes the plate upstairs to an isolated room? What goes on inside that world? The little lady is forever wondering and out of sync with it. The noise is reverberating inside the teenagers head. He can hear the songs from last week’s concert and it creates psychedelic pictures in his mind. He has partaken of the food from the dinner table, but he is not really connected. Time soon to speak to his girlfriend. Pretty nothings to be poured down via the net. She will be waiting. Then he has to sneak out and meet his friends. Together, they plan to check out the nearest bar. He hopes they can get a drink there. Otherwise there is the local grocery store. They should be able to buy a six pack there. A night of chilling out with friends, but for him its living life at the edge. Tonight as the son goes sneaking out he sees it and wonders what action to take. Can he fight the world? He has already isolated himself from it, but can he cut linkages so that his family is cocooned? What would his father have done in just such a time? But his father is gone and cannot tell him much. Did father feel the same isolation in his time? Had he been as difficult to please and handle. Perhaps so! Memory plays its games with time and events. Anyway his father was from his home country and a different timezone. The lights dimmed, he cannot sleep. There is so much happening in this world, for which he has no answers. He looks at the stationery form of his wife. It was not meant to be this way. A lifetime of struggle, culminating in a mortgaged house, middle level job and a progeny who he cannot feel connected to. No there are no easy answers. Just to soldier on; live as best as one can. Live on hope. Yes hope! That has not faded away. Hope is the essential which keeps him going, when he wakes once more in the morning and finds the morning sun beaming into his room through the window. Today could be the day when all goes right once more.